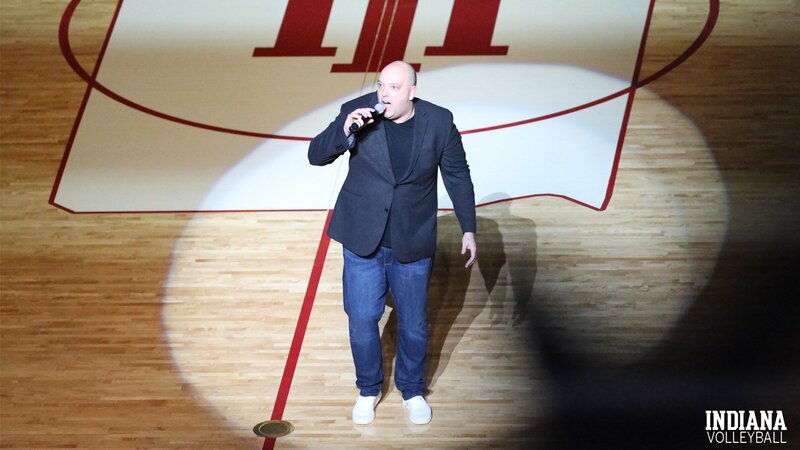 This was how new Indiana volleyball head coach Steve Aird introduced himself to Indiana’s freshman class at the annual IU Spirits & Traditions gathering, where freshmen are invited to learn about the history of the school’s traditions. Indiana’s freshman class this year is over 8,000 students, and if the way that Aird had them rocking the legendary Assembly Hall is any indication, Indiana’s average game attendance, which was just 780 last season and 13th out of 14 Big Ten teams, is going to jump this year. Indiana’s finishing Big Ten position last season in the win-loss table was the same as its finishing Big Ten position in attendance: 13th out of 14 teams. They had just 1 conference win, over Rutgers, and finished 1-19 in the league. Aird comes from Maryland, a team that was 7-13 in the Big Ten and 10th in the conference, in spite of a number of injuries to star players that derailed a red-hot start for the Terrapins. The Hoosiers started its season in legendary Assembly Hall, also home of Indiana’s basketball team, for its annual red-white scrimmage, and will then hit the road with 11-straight season-opening games away from Bloomington. Construction on the new Wilkinson Hall, originally scheduled to be completed in September, has now been pushed back to November. Instead, the team will start their season at University Gym, where they’ve played since 1996, which has a capacity of 2000. Current targets hope to have Wilkinson Hall open in time for the team’s regular season finale on November 21st against in-state rivals Purdue. Indiana starts their season on Friday with a double-header against UNLV and LIU Brooklyn in Las Vegas. Their first matchup against a Power 5 opponent comes on August 31st, when they play another program with a new head coach, Texas A&M, in State College, Pennsylvania. Aird said the new arena helped attract him to Indiana. They better hurry up and finish it before he leaves for a school with an even bigger arena! That would include most B1G schools.